How to upgrade from Trial to Full key? 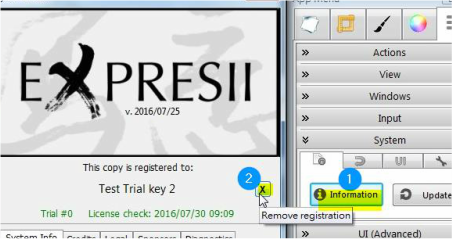 With the free trial key you can use Expresii with basically all the same functionality a Full key gives you, so you can simply wait for Expresii to prompt you to upgrade after a certain number of uses of the trial key. However, if you don't want to wait, you can remove the current registration as shown in the figure, and then you can register again with another License Key. To Factory Reset the whole app, close Expresii and go to Start Menu >Expresii>Factory Reset. There is also an option to Factory Reset one particular Preset set only via its popup menu>Whole Set>Factory Reset. How to enable Location for use of G-Sensor (Gravity Sensor)? Tablet PC usually comes with G-Sensor (for auto screen rotation). If you try to use the G-Sensor in Expresii, you will be prompted to enable Location access for your device. On Windows 10, you go to Settings>Privacy>Location to enable Location Service. After you enable that Exprsii should be able to use the G-Sensor for virtual painting surface rotation. How to import color pan sets? How to Adjust Loading Presets Lighter or Darker?